Prepare to fork over a lot of time and cash. When you load up Respawn Entertainments latest battle royale game Apex Legends, you’ll have a small selection of six characters to choose from. Two of these characters, however, are locked: Caustic and Mirage, a gas spewing tank and a decoy trickster, respectively. By unlocking these characters, you bring the total roster of legends to eight. But getting them comes with a cost. 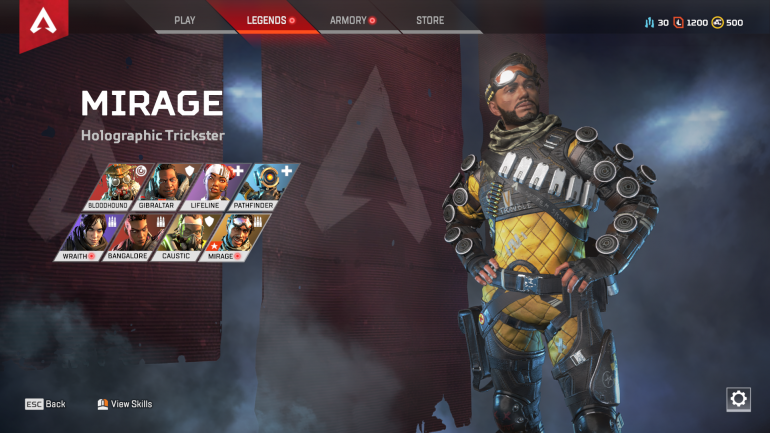 To unlock both Caustic and Mirage, you will need to either buy the duo with in-game currency, known as Legend Tokens, for 12,000 each, or fork over real cash to get enough Apex Coins (750 each or 1500 for both) to add them to your arsenal. You only get Legend Tokens by leveling up, so be prepared for a long grind to unlock the characters by normal means. Apex Coins, however, are the premium currency in-game that you can use to buy characters, cosmetics, and other items that don’t really affect the overall game experience— so if you’re planning to buy a lot of stuff for your matches, it might be worth investing into these. The game is free-to-play, after all, so certain characters and cosmetics will always be locked behind a paywall. Any other future legends will also likely be unlocked in a similar manner, similar to other free-to-play games like League of Legends.